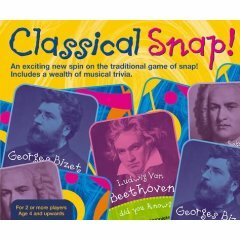 An exciting new spin on the traditional game of Snap! See who's the fastest at matching the famous composers. Includes a wealth of musical trivia. Ages 4 and up. 2 or more players. 52 standard sized playing cards.